Prompted by an article in the Guardian by George Monbiot, and by Vaughan Roderick's blog, I thought this would be a good time to look in detail at how we can improve Wales' rail network. I've asked for copies of the proposal and map, and will post details when I get them. It's not often someone reads interesting and enlightening articles about Wales in the London papers. So it was good to see this article by George Monbiot in the Guardian. George argues that we should consider a plan by the inimitable Father Deniol to open/reopen a railway line through central Wales to connect the north and south. I won't repeat the argument, because the article is one worth reading in its entirety. The suggestion isn't as unrealistic as it might seem at first glance. In contrast to the department of transport in England, the Welsh and Scottish governments have adopted a policy of reopening railways for passenger use where there is justification for doing so. In Wales the lines between Barry and Bridgend, and Cardiff and Ebbw Vale have been reopened, and the services have proved particularly popular. In the case of Ebbw Vale (re-opened earlier this year) passenger numbers mean that the government is already having to consider improvements to increase the length and number of trains. Now, the big advantage that the Ebbw Vale and Vale of Glamorgan lines had was that the track had not been lifted, the two lines continuing to be used for freight services after passenger services ended. This isn't true of the majority of the railway lines included in Father Deiniol and George Monbiot's scheme. "Considering the success of reopening the line between Ebbw Vale and Cardiff, I am going to seriously research options for reopening disused railway lines for new passenger services." You don't need to be a railway expert to list the possible schemes. Huw Lewis is already campaigning to reopen the line from Ystrad Mynach to Dowlais, while the Heads of the Valleys scheme is investing over half a million pounds to extend the rail network which could, ultimately, connect Blaenafon and Pont-y-pwl. In the north possibilities include reconnecting Caernarfon and Bangor and reopening the Vale of Clwyd line. The later is part of Father Deiniol's scheme. This will need faith and vision - but of course these are two of Father Deiniol's virtues! If you want to study what's possible, the Adlestrop Railway Atlas (pdf) is fascinating! One of the comments referred to this article in the Western Mail six months ago. Inspired rail-link idea could unite us as a nation. I've just received a copy of Yn Ein Blaenau's proposal from George Monbiot. I wasn't quite expecting the route they propose between Corwen and Welshpool. It looks promising. I'll comment after I've had a proper look at it. Of course, some will say that this type of project is just not possible, but it is worth noting that a similarly ambitious scheme is now taking place in Ireland. 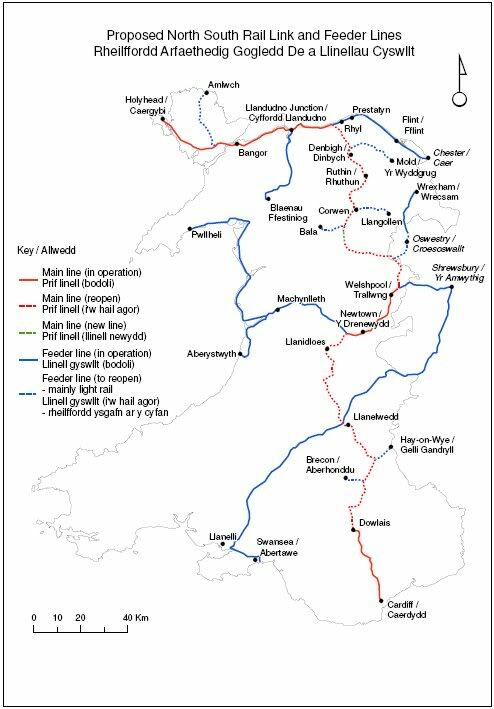 The re-opening of the ‘Western Corridor’ is very similar to this ‘All-Wales’ rail proposal in that it involves approximately the same amount of line re-opening and goes through remote regions to connect them to vibrant centres. This is a pioneering and inspired idea that could gain much public support and deliver many benefits to Wales. Given the lack of vision that our politicians are often accused of, I would urge them to look up from their TV screens in the Assembly Chamber and to commission a full feasibility study into this plan. With the Assembly is about to spend £1 billion on plans for a bypass around Newport (to alleviate rush hour traffic) and for upgrading the Heads of the Valleys road, surely this public money would be better spent on developing a coherent rail network around Wales. It is time the Assembly lived up to its green credentials and supported a scheme that would not only bring sustainable economic benefits to our nation but, more importantly would provide the links between North and South Wales that would finally enable Wales to unite, in transport terms, as a nation. I think it's tremendously encouraging that he should support the idea and, particularly, support it against a scheme like the Gwent Levels motorway. Without in any way wanting to be patronizing, we need Tories with this sort of attitude to improving Wales' infrastructure. This is exactly the sort of thing that should receive consensus support across all parties. With the cancellation of the Gwent Levels motorway, while there is still a need for road improvements, there is also a need to get people off the roads and back onto public transport, and I suggest that the existing railway network around Newport could be developed into a regional metro for little cost. It is already planned to redirect the newly opened line from Ebbw Vale, which currently turns West after Rogerstone towards Cardiff, to head east into Newport, and this would form the first leg of the Metro. After Newport, I would send trains east on the GWR line with new stations at say Maindee, Liswerry, Maindee and a parkway station at Llanwern/Magor. A second line would be created on the existing line from Pontypool, with new stations at say Llantarnam and Caerleon before running into Newport, and then continuing east along the GWR with new stations at say Duffryn, and Marshfield, and on into Cardiff with new stations at St Mellons, Wentloog, Rumney Tremorfa and Splott. All of the lines exist, and half of the stations, it is just a matter of finding suitable rolling stock and some carefull scheduling to avoid delays on GWR main line and the Newport to Crewe line. And more importantly, new housing developments and commercuial developments should be centred on the new stations, not at motorway junctions as presently done. I'm all in favour of that, Penddu. 4.32 The Gwent Rail Study produced for the former Gwent County Council in 1990, identified the opportunity to provide new stations at Caerleon and Rogerstone. In addition the South Wales Consortium of Local Authorities commissioned a report from Halcrow Fox which recommended a new station facility at Coedkernew to cater for the passenger transport needs of the LG Development and for the Duffryn Expansion Area. The TIGER (Transport Integration in the Gwent Economic Region) Public Transport Strategy is being reviewed to investigate the potential for, and siting of, a railway station at Llanwern as part of the Transport Development Area within the Eastern Expansion Area. 4.34 The existing rail network may also provide opportunities for road-rail transfer points. Development of these facilities could contribute to reduction in heavy road freight and be important to the economy in being attractive to inward investment. Support will be given to applications for Freight Facilities Grant and Track Access Grant. A detailed planning consent for a Rail Freight Terminal has already been granted at Llandevenny in the east of the County Borough. However I would like to add a little something to your idea. There is a line from Bassaleg (Pye Corner) to Machen which is used for carrying material from the quarry. I see no reason why this shouldn't be developed for passenger use too, with stations at Pentre Poeth, Rhiwderin, Lower Machen and Machen. However an even better thing to do would be to reinstate the line beyond Machen to run into Caerffili. This would pick up Graig y Rhacca and the large new housing development at Waterloo, and a new station in east Caerffili. The more important strategic gain would be that it would allow people on the Rhymni line to get to Newport just as easily as they can currently get to Cardiff. One of the big factors limiting the future growth of services in the Eastern Valleys is that everything is funnelled into Cardiff over the Newport Road bridge immediately north of Queen Street station, where the line narrows to just two tracks. The pressure will be even greater in the future because Tad Deiniol's north south line feeds into it. I've just found something else to confirm your ideas about new stations on the line up to Pontypool, Penddu. This is from SEWTA's (South East Wales Transport Alliance) response to Network Rail's Draft RUS, dated August 2008. The case for a new station at Caerleon is also strengthened by the increasing road congestion through the town, and on the roads into Newport. The impacts of increasing road congestion, and potential for modal shift to rail, are an issue along the whole route, particularly between Abergavenny and Pontypool where the neighbouring A4042 is a increasingly busy single carriageway road and with no proposals to address the congestion and heavy use made of that road. Similarly, around Cwmbran and Newport itself, the existing dual carriageways are experiencing increasing instances of congestion. Preliminary studies of new stations at Llantarnam and Sebastopol have been undertaken, and have demonstrated the value of taking forward these proposals in the context of the introduction of more frequent local services to Abergavenny. The argument has never been clearer. Looking at HS2, we see a north-south Y-Shaped HighSpeed 'network' for England. I say, how about a north-south Y-Shaped 'High Speed' 'network' for Wales, scaled down to reflect Wales' much smaller population. The key differences would be that the Welsh network would use sections of existing line (upgraded in many cases) and have a top speed of 90mph instead of over 200mph (operated by 2-car 158s instead of umpteen-car HighSpeed trains). Would the Barrnet consequental Wales is supposed to get out of HS2 (reported to be around £2bn) be enough to build my proposed Welsh equivelent? If not, how much of that network would it buy us? Carmarthen - Aberystwyth would be the next major Welsh new rail links project on my to-do-list, but a simple reopenning would be no good. WAG have rejected that idea since (I think) the times at the time of clousure were slower than todays bus. Personally, I think things could be done a lot better today, Lampeter to Strata Florida (that vacinity, I don't know where the station was) looks pretty straight and hence could perhaps be built for 90mph capability, but the rest would need alot of straightening (including a tunnel towards the southern end) to make it worthwhile, which would add a lot of cost. The traffic in the morning into Aberystwyth is terrible though, so how about building a bus-only road (designed to be suitable for a rail alignment) from Llanfarian (where the worst of the traffic begins) into Aberystwyth on the understanding that, if a railway ever does arrive from Carmarthen, the buses will make way for the trains?